Have you started your Christmas shopping yet? Every year I say I’m going to start earlier, but the busyness of life always seems to get in the way. I make mental notes throughout the year when I hear my husband or son say, “That’s really cool” or “I could really use this…” Or when I’m visiting my parents, I’ll notice that my mom is “making do” with something that really needs to be replaced. Often November hits and I rack my brain trying to remember what these items were! Luckily this year, I was a little smarter and started a notepad of gift ideas for everyone back in the summer and it’s given me a leg up. I’m a bit stumped on what to give a few people, but I’m sure I’ll come up with something. There are always those moments of panic, like when my niece’s pogo stick she really wanted didn’t show up in time and I had to scramble to find her something else two days before Christmas! Somehow it always comes together in the eleventh hour, but the stress can overtake the joy of the season. Working online (blogging, creating plans and sourcing for clients, doing research and freelance writing) means that I’m always coming across new products and ideas. I see A LOT in a day- some great and some not-so-much! I decided to put together a holiday gift guide to showcase some of the items for women and teen girls that caught my eye. Perhaps some of these will be the perfect fit for someone on your list (maybe even you). Top 1) This cologne and candle by Jo Malone are beautifully scented. Although there are so many to choose from, my favorite has to be the Nectarine & Honey Blossom cologne and Lime Basil & Mandarin candle. 2) I just love Oxfam Canada’s charitable gifts. This beehive kit gives small-scaled farmers in under-privileged countries training and supplies to produce their own honey. 3) You can’t go wrong with personalized gifts from Clairebella. This monogrammed cutting board is stylish and functional. 4) What better way to start your day than with the Barista Express by Breville. It grinds beans fresh, makes the perfect cup of expresso and froths milk for a latte. Middle 5) Tiffany & Co. designed this beautiful double heart pendant inspired by a key ring from 1969. I love the combination of the signature blue and silver. 6) Crabtree & Evelyn’s hand cream is still one of my favorites for it’s non-greasy feel and conditioning abilities. Their Source line is infused with a sea air scent that I love. 7) Teenage girls will adore this limited edition fragrance set by Benefit. It’s perfect for the girl who likes to change things up. 8) This colorful patterned scarf from Forever 21 is the perfect accessory for any age. 9) This cashmere scarf from Restoration Hardware is crafted by artisans in India and is the ultimate in softness and luxury. Bottom 10) Yummy! She can enjoy a perfect batch of Mercedes White French Macarons at home with her mix available on Etsy. 11) This lambswool intarsia patterned cardigan by TNA is the perfect addition for winter comfort. 12) I just love the style and functionality of this wool and cashmere sweater coat by Lord and Taylor. It’s a perfect wardrobe staple. 13) This Beautiful Dreamer makeup collection by Too Faced is a great value and will definitely be a hit with teenage girls. Mercedes White French Macarons is generously giving away one of their mixes. The package includes all of the dry ingredients necessary (eggs and fillings not included), a piping bag, and parchment paper. All of the ingredients are precisely measured according to Mercedes’ tried and true recipe to give you that slightly crisp shell with a soft chewy interior- Yum! To be entered: visit Mercedes White French Macarons and come back and leave a comment below about which mix you will choose if you win. Your information is kept strictly confident and is used for award purposes only. Open to residents of Canada and US. Contest closes Saturday, November 26, 2011 at 8 pm MST. Winner will be drawn randomly (using random.org) and announced on Sunday, November 27. If winner does not claim within 48 hours, another name is randomly selected. Did you know that Mercedes White also offers macaron making classes? Wouldn’t it be fun to learn how to make French Macarons! She’s coming to Calgary in the new year. Let me know if you’re interested and I’ll send you some information. What fabulous gift ideas have you stumbled across this year? Do you have anything special on your wish list? What would be your pick from the gift guide? Some great options! I am loving the macaroons! Don’t they look heavenly. I’m really hoping that enough people are interested in a class so I can learn how to make them. Happy Thanksgiving! Mmmm! They sound delicious, especially the Maui Wowie. I have been thinking of trying to make them for some time too while not being able to work in the States- gotta learn something new!! I love the macaroon idea. I’ve always wanted to try making them. I’d probably pick red velvet, birthday cake, or pink lemonade. WIth her vanilla mix you can basically come up with any flavor. It’s perfect! Thanks Lindsay. I have to admit a few of the items are on my wish list! YUM YUM!!! HAPPY THANKSGIVING SHAUNA! – shared on facebook and tweeted you! Thank you. Happy Thanksgiving to you as well! 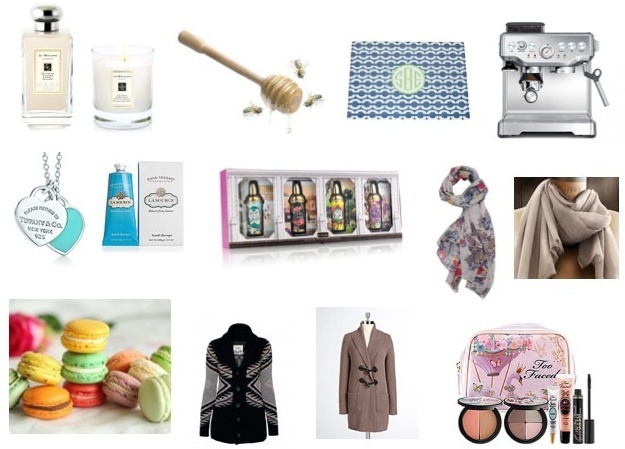 Love several items on your gift guide. I’d want the chocolate mix- they look delicious! Okay, I could take anything you’ve included on the guide- or all of it! The macarons look delicious. I would want the vanilla so I can make the red velvet! I love that she is a Calgary girl!! I would love to take her class when she comes to town. I love her site and her packaging and would love to try one of her kits.